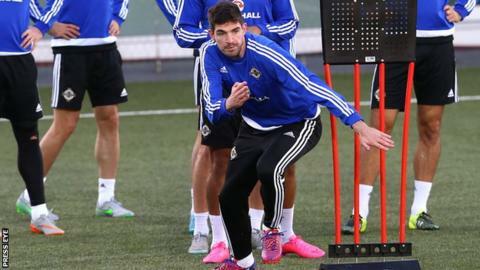 Northern Ireland boss Michael O'Neill says striker Kyle Lafferty is fit to lead the line against the Faroe Islands in the Euro 2016 qualifier. The Norwich forward, who has scored five goals in the Group F campaign, has recovered from a knee problem. "He's looked fine, he's trained since Monday and had no issues - he's completed every session we've done," said O'Neill. "Kyle is in good form and he's upbeat. He's really keen to play." Lafferty is set for a first taste of competitive action since picking up the knee injury in June. West Brom's Chris Brunt is also over his hamstring problem to start a game that could see Northern Ireland open up a five-point gap in second place ahead of a possible monumental meeting with Hungary in Belfast on Monday. Despite the prize of a spot in France next summer inching ever closer for his men, O'Neill is confident his side's focus will not waiver down the stretch. And he does not believe the Faroes, who have defeated Greece home and away already, can be viewed as pushovers. "I don't feel any added pressure than already exists," O'Neill said of the growing anticipation back home. "The target is qualfiication. We've won twice away from home already in the group. We believe it will be as difficult to win here as it was in Greece, in Hungary. "I get the feeling as we approach game seven leading into the final phase of the campaign the players are really focussed on what's required to get over the line.